MINNEAPOLIS — It’s still early, of course, but the winner of tonight’s Packers-Vikings showdown at U.S. Bank Stadium in Minneapolis tonight will have sole possession of first place in the NFC North after just two weeks. Earlier on Sunday, the Lions blew a 12-point lead in the fourth quarter at home and lost to Tennessee, 16-15, to fall to 1-1. The Bears, who play Monday night against the Eagles, are 0-1. So, the winner of tonight’s matchup of 1-0 border rivals will be the only team in the division with two wins after two weeks. The Packers and Vikings have combined to win the NFC North title in eight of the past nine seasons. Green Bay won in 2007 and then four straight from 2011-14. Minnesota won in 2008-09 and again in 2015. CB, WR depth: The Packers’ depth in the secondary will be tested tonight, with No. 1 CB Sam Shields out with a concussion and rookie Josh Hawkins also out with a hamstring injury. The second-year trio of Damarious Randall, Quinten Rollins and LaDarius Gunter will likely be Green Bay’s alignment in the nickel defense, with either Randall or Rollins playing the slot. For the dime, Micah Hyde likely comes in to play the other slot position. Here’s a story from this past week on Rollins and how he bounced back from some rough moments in Week 1 at Jacksonville to make a big play late in the fourth quarter. For more on all three of the second-year CBs, check out this story from prior to training camp. As far as the rest of the roster, the Packers actually have all seven of their wide receivers active for tonight’s game. Rookie Trevor Davis, a fifth-round pick out of Cal, will be making his NFL debut, assuming he gets into the game at some point. Sunday night history: This will mark the Packers’ 33rd appearance all-time on Sunday Night Football (on ESPN, TNT or NBC) and their seventh against the Vikings. The Packers’ first ever Sunday night game was actually here in Minneapolis at the Metrodome, in 1990, a 23-7 loss. After that, the Packers won four straight Sunday night contests vs. the Vikings before dropping last season’s Week 17 division-title showdown at Lambeau Field. Green Bay’s 4-2 record against Minnesota is part of its 23-9 overall mark in Sunday night games. 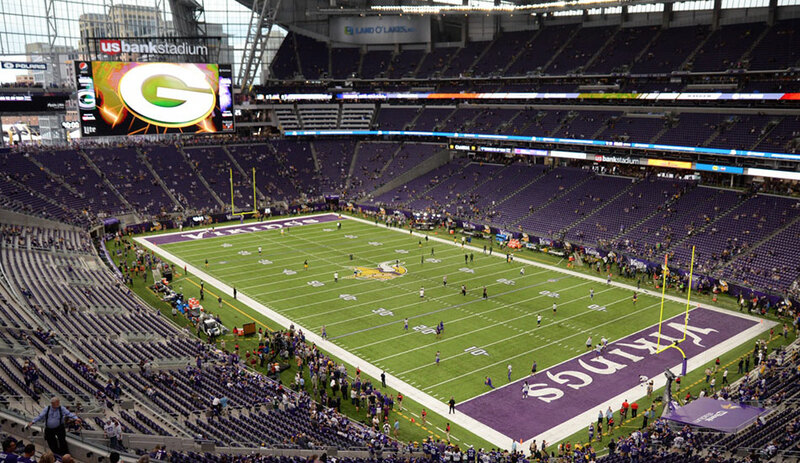 The new stadium: Some facts distributed to the media regarding U.S. Bank Stadium include its total price tag of $1.1 billion, its size of 1.75 million square feet (twice the size of the Metrodome) and a capacity of 66,655, expandable to 70,000. New QB for Vikings: In the Mike McCarthy era, the Bears and Lions have combined to use 11 different starting quarterbacks against the Packers. Tonight will mark the 10th different starting QB for Minnesota, whether it’s Sam Bradford or Shaun Hill (and it’s been reported to be Bradford).